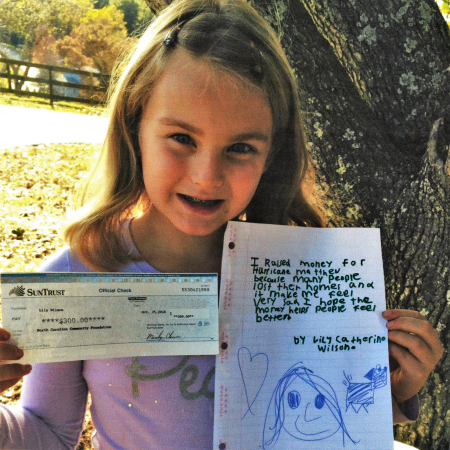 She is seven years old and lives in Weaverville. During the weekend of Hurricane Matthew, her cousins visited to escape the storm. While her cousins were fortunate to see no damage from the hurricane, she saw on the news just how many people were affected. And she wanted to help. She convinced her father to let her raise money at the family business to help victims of Hurricane Matthew. The family spent all day baking cookies and brownies to sell the next day. With snacks and a smile, she manned her booth for hours. She sold cookies, brownies and coffee. She even collected donations directly from customers. Lily raised $300. She couldn’t believe everyone was being so generous to people they didn’t even know. This photo is now posted in the family business – Broken Arch Auction Gallery – showing the community the money raised and explaining how it will benefit hurricane victims through the North Carolina Community Foundation Disaster Relief Fund. 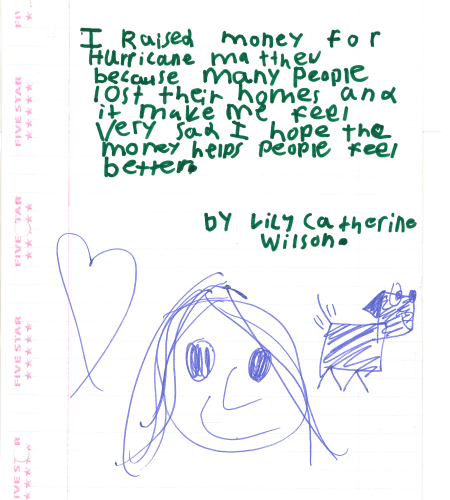 Lily hopes this will help inspire more people to give. More information on the NCCF Disaster Relief Fund is available here. Click here to donate now.